Apple first launched ARKit last year, but now it's taking it to another level with ARKit 2.0. At its Worldwide Developer Conference 2018, Apple announced several new upgrades for its augmented reality platform. If you've got a measurement app in the App Store, we're sorry to say you're in trouble. Apple has announced a new AR app called Measure. You can simply point at an object in AR, tap at the corners and get an accurate measurement. Craig Federighi, Apple senior vice president of software engineering, says Apple's tight integration of hardware and software allows it to better marry software and sensors to enable tight, accurate measurements. So much so that you could use the Measure app to measure something as small as a photograph. Apple said it teamed up with Pixar (yes, the studio that makes animated movies) to create a new file format called USDZ. The file format is essentially an easy way to share 3D objects and graphics, which can be used throughout iOS. So you can share them in iMessage, Mail, Safari and more. You can also quickly pop them into reality via the camera. Because USDZ is also available in Safari, if you see any 3D objects on a website - like a chair - you can quickly pop the object out of Safari and test it out in the real world. Other big upgrades include improved facial recognition, realistic rendering, 3D object identification and shared experiences. You'll be able to use ARKit-enabled apps to play multiplayer with friends. 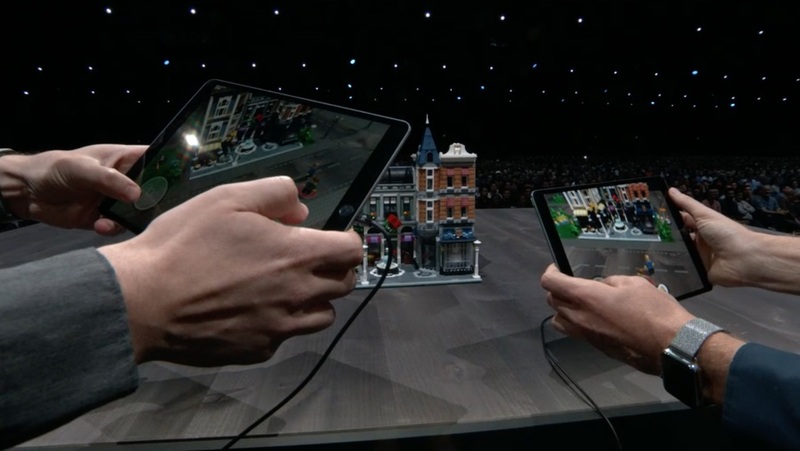 For instance, you'll be able to build and play with AR Lego sets with friends. Apple is also working with a variety of companies, like Adobe, to help create 3D tools and libraries that are compatible with USDZ. ARKit 2.0 will be available when iOS 12 rolls out later this fall. In other WWDC 2018 news, Apple unveiled watchOS 5 alongside a new Pride Watch band and watch face.